Now that fall is coming and the temps are cooling off a bit, it's a great time to take a camping trip...read by fire, drink under the stars. And if you're heading to the woods this weekend, don't forget the sangria! 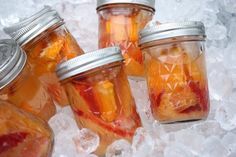 Fill up the mason jar with peaches, strawberries and apples. Pour in vodka a 1/4 of the way up the jar. Fill up the remainder of the jar with wine; cork the rest of your wine. Chill sangria concentrate overnight or at least for several hours. Pack up the sangria concentrate, 1-liter bottle of Ginger Ale and remaining wine in an insulated bag. When you get to the campsite, mix all 3 together in the pitcher and enjoy! *Recipe originally found on Mighty Mrs.